Hong Kong, one of Asia’s major concrete jungle, is indeed a city that’s so easy to fall in love with. It didn’t take much for me to fall for it either. I needed no offbeat paths and hidden gems to be fully captivated by this city. It was love at first sight, and I fell quickly and madly. As you already know from the title, this isn’t one of my usual adventure in search of my beloved off the beaten paths. On this post, you’ll find no secret restaurants or hidden waterfalls. This post is as touristy as it will get. This will be your starter pack for Hong Kong travel. I mean, if Hop On Hop Off doesn’t scream out a tourist mode enough for you, then I don’t know what will. And hey, do not even get misconstrued because this is not one of those tourist vs traveler debate either. I’ve already done that here.– (READ: Travelers vs Tourists: An Honest Comparison). Either way, Big Bus tours fulfills your tourist fantasies without being stuck with a big group– it allows you to wander and explore basically at your own pace, and as you please. Say what?! Yup, they give you FREEDOM! If you haven’t heard of the Big Bus Hop On Hop Off Tour, let me brief you real quick. Big Bus Tour is available in 18 major cities across the world– Hong Kong, London, San Francisco, New York, Dubai, Washington DC, to name a few. It’s basically a tour bus that offers different stops across the city and will allow the passengers to get on and off wherever they prefer— hence, hop on hop off. So for instance, you’re not feeling the next stop, you can stay on board until you reach the next stop of your preference. The bus wouldn’t wait for you, but instead, you’ll get back on the same stop once you’re done touring the place, and another Big Bus, which comes by every hour or so, will be there to let you hop back on to take you to your next stop. Pretty cool, right? 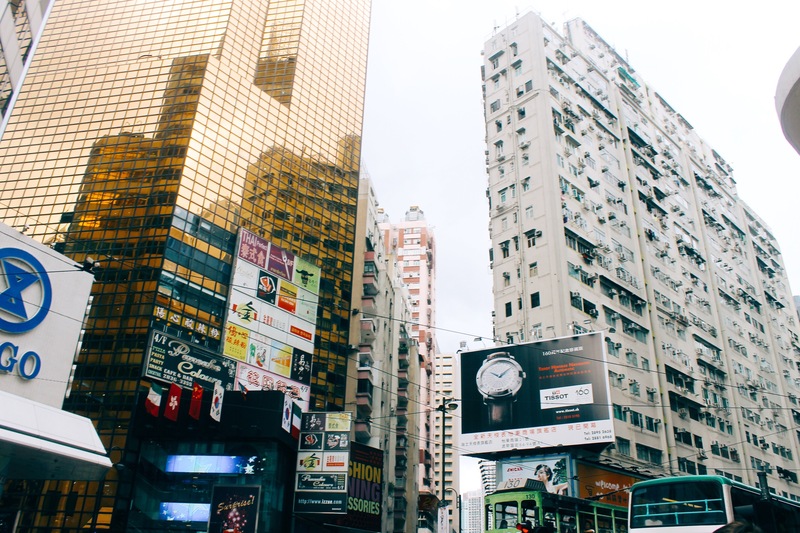 I was a little of a traveling noob when we went to Hong Kong, and although I had a few places in mind that I have researched and prioritized to see, we signed up for the Big Bus Tour because it was just a lot more convenient since we were traveling with my mother-in-law. It wasn’t one of those times where getting lost would be welcomed and minimal walking would have to do. It was perfect that we did this because I actually ended up having so much fun. There are different bus tours operating in Hong Kong, but we found Big Bus to have the most credible reviews in Trip Advisor. There are different routes and packages to pick from with Big Bus– there’s 42 hours, Day and Night tour, and in our case, we picked the 24 Hour one. We only had one extra day to spare in Hong Kong as we had other plans for the next days, so this was perfect to see as much of the city in such a little time. The 24 Hour or Premium Tour cost us $40 USD at the time (2013), and when I just checked now, it’s at $49.50. You could definitely save money by going DIY, but as always, there’s pros and cons– which we’ll get to later. The starting point of the tour is at the Avenue of Stars, which also happens to be the ending point later in the afternoon. We didn’t buy any tickets in advance, but you’ll see a lot of sales person ready to hook you up. Just go early in the morning to make the most of your time. They accept credit cards and it was a pretty hassle free process.I’m not going to bore you with all the stops that we made, but I’ll keep you entertained with photos and I’ll talk about the highlights instead. 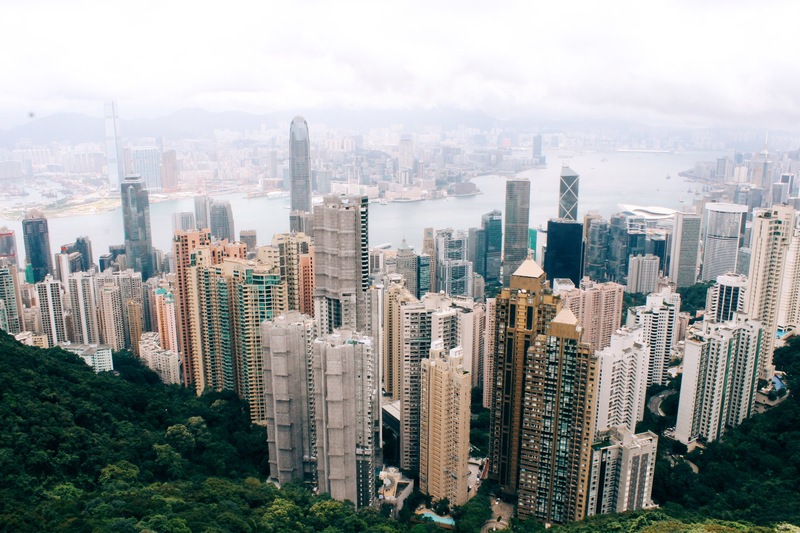 One of the must see places in Hong Kong is Victoria Peak. It offers you a gorgeous 360 degree panoramic view of the city. And although there are many other less touristy places that offers a captivating vista across the city as well, like I’ve told you in the beginning, this is the Hong Kong starter pack. So if you’re all about the legendary tourist landmark, this would be Hong Kong’s. I loved, loved, loved the view here. You’re up in the mountain, and as a matter of fact, you have to take a tram to get up here (already included with the Premium tour), and once you’re at the top, your eyes will be feasting on the view of this concrete jungle. Remember that Hong Kong is an island, so you’ll see the body water surrounding you as well from this view. There are plenty of western restaurants to choose from at Victoria Peak, and aside from that, there are also a variety of Hong Kong and Chinese restaurants. You also have the option to go to Madam Tussaud’s Wax Museum, which is also located here, but the tickets are not included with the Premium Tour so you will have to purchase it at your own cost. We skipped out on that, since I wasn’t even particularly amused by the Madam Tussaud’s in Las Vegas, I didn’t think I’d be any more impressed here. One of the temples included in the Big Bus Tour is Man Mo Temple, which I believe happens to be one of Hong Kong’s most significant ones, as it is considered as the oldest temple in the island.The temple is known to be dedicated to war and literature Gods. It’s a small temple with a strong scent of incense enveloping the entire place. Along the streets are a strip of local stores selling antiques– from potteries to jewelry. There wasn’t much to do so we spent most of the time waiting for the bus. 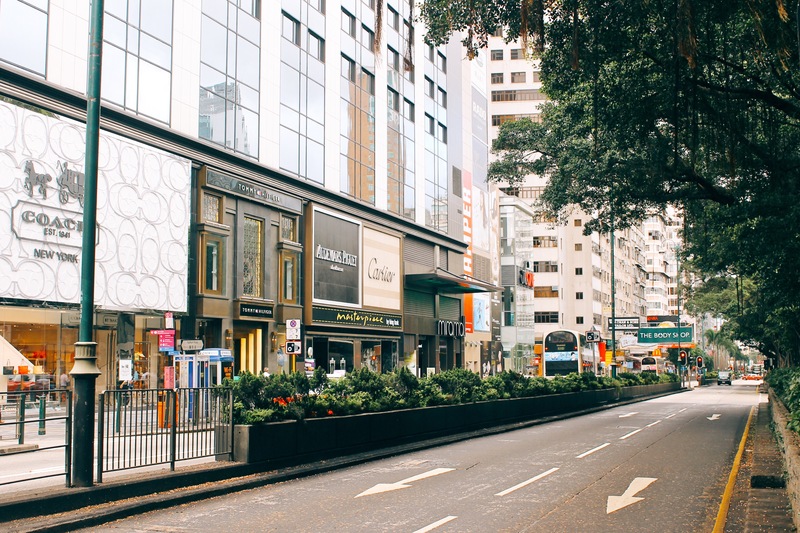 We made a few stops along the way, one of which was Causeway Bay, which was described as the “olympic games of shopping” in the official Hong Kong tourism website. 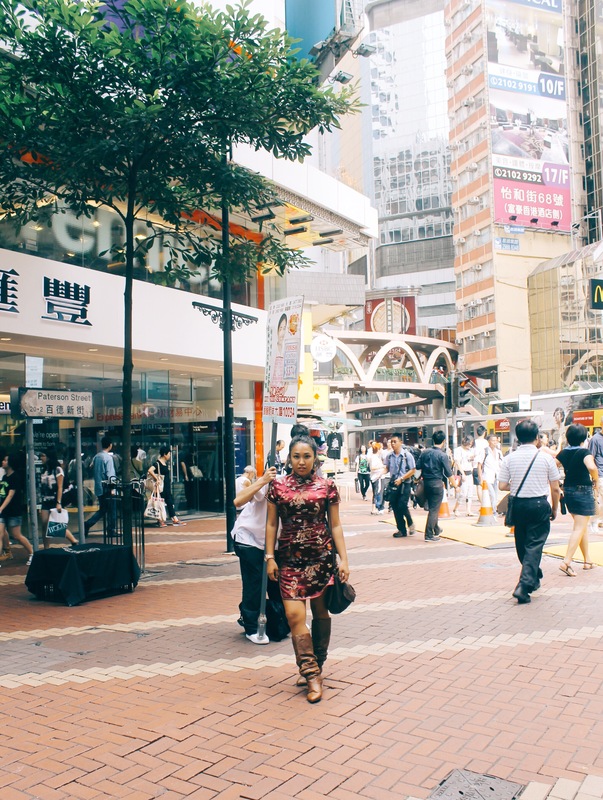 There are different shopping areas across Hong Kong Island that you can hop off, depending on your preference. And that’s the beauty of this tour, you’re never forced to see the places you have no interest in. At the end of the day, we managed to catch the ferry (also included in Premium) to get back to Tsim Sha Tsui, specifically in Avenue of Stars to catch the light show, which unfortunately, we missed, because I wanted Laduree’ macarons instead. I do not regret going for the bus tour at all, because like I said earlier, it’s a great way to see as much of the city in a limited time. I like that it gives you the freedom to choose the places you’d rather see and that it allows you to hop on and off as you please. I ADORE the fact that you aren’t stuck with a big group, and I like that instead of a tour guide on the bus, you have the option to listen to the audio guide instead. Would I recommend it to you? Absolutely! This is normally not my preference but I did have a lot of fun and I managed to see most of the places I wanted to see through this tour. But of course, consider your circumstances and what you’re looking for on your trip since we all travel differently. Consider the pros and cons, and if Hop On Hop Off tours are for you, then I’m sure you’d have a great time with this one. Disclaimer: I was not paid nor compensated for this tour. Opinions are my own. I lived in Hong Kong last year and these photos definitely made me miss the city even more! Great post. Sounds exciting! And lovely photos. Makes in wanna go there right now! I went on the Hong Kong hop on hop off bus tour last summer when I visited! I never take bus tours, I always opt to walk or bike or do it myself in some way. I was only in HK for the weekend and I was with my parents, so to make them walk everywhere wasn’t going to happen. I was surprised how great this tour was! It is definitely a touristy thing to do, but if you’re short on time, it’s a great way to see the whole city! Somehow just because of thia touristy feel I never take up the hop in hop off tour buses. Haven’t taken one in London yet!! I’ve never even thought about doing a Hop on Hop off Bus tour but this actually looks like fun! Lovely photos! I never been to Hongkong but would love to visit there someday. The bus tour looks like a good option if ever. Good way to see the city quickly but I always feel like a cow being herded on those types of tours. I LOVE the photo with the cityscape though, looks like a lovely view! The few times I’ve visited HK, I rely mostly on the subway and very limited opportunities of commuting by bus. But there’s limited things to see when you’re underground. Maybe next time I’ll do this hop on hop off bus, as what I also did once in Singapore and also in Seoul. I rarely use hop on-hop off buses, for the exact reasons you mentioned above, but I agree that in “concrete jungles” like Hong Kong, they can be a very efficient way to get orientated! Great post! I love your pictures and you give a lot of information about your personal experience. The skyline of Hong Kong is really amazing! Hong Kong sure looks beautiful. You took some great photos. Looks like you guys had a great time there. That’s awesome. I would love to visit that place myself one day. Thank you for sharing. Elaborate travelog! Loved the photos. The bus looks so convenient for tourists. It’s nice to go on bus tour from time to time, it’s a refreshing take on touring around a city you’re unfamiliar with. Hong Kong looks so beautiful and there’s a lot of sights to see as well. You can really save a lot with hop on and hop off. This is helpful since Hong Kong has many attractions. You can really save a lot with hop on hop off. This is helpful since HK has a lit of tourist attractions. I love how your photos show yourself having fun instead of the normal touristy photos! Yes, now that I know about the hop on and off, I will most probably try that instead of the train next time! Riding on a HOHO in Hong Kong is ideal for tourists who visit HK for the first time and don’t want to explore via the train. This is also good because you have the freedom to drop off whenever you like to explore the destination and take more pictures. I never knew Hong Kong had so much to offer – I am planning to go in May so this piece will come in handy – def gonna do the HOHO tour – Infact, I did it in Paris, Jakarta and few other cities – Love these tours . You get to see all the highlights of the city without spending a bomb. You look great with your partner, the photo wherein there is a photographer in a by-stander, I thought it is real..hahahaha…. Anyway, great to know about the Big Bus Hop on Hop Tour. Reading it gives me more details about how to become a full tourist. I admire the bubbly feelings in all your pics. I guess it’s preferably to explore the HOHO tour! Many thanks for the creamy insight into the tons of “goodies” Hong Kong has to offer. Keep radiating with ease!! This kind of visiting a city is a great idea when you’re short of time – you get to know the most touristy places. But it also a good idea when you have more time – it makes for a good start in understanding the city. I used to live in Hong Kong years ago and never got to try the hop on hop off bus. If I was recommending friends what to do I would definitely tell them about the bus because the city is so big you need a way of getting your bearings! Your pictures made me miss it so much!